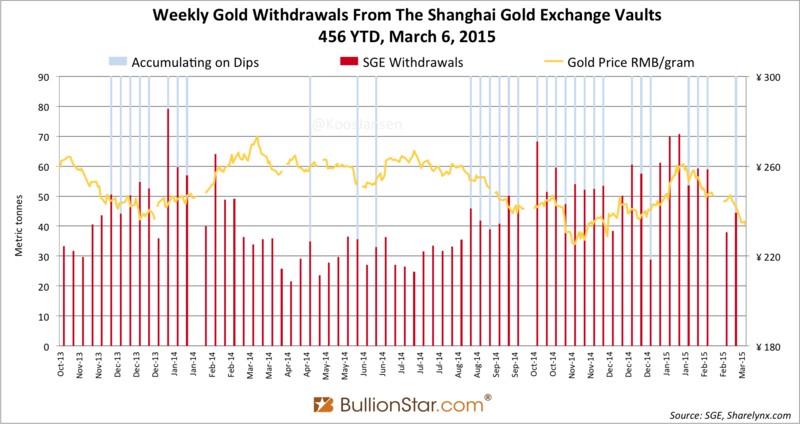 Chinese wholesale gold demand, that equals withdrawals from the vaults of the Shanghai Gold Exchange (SGE), accounted for 45 metric tonnes in week 9 of 2015 (March 2 – 6). 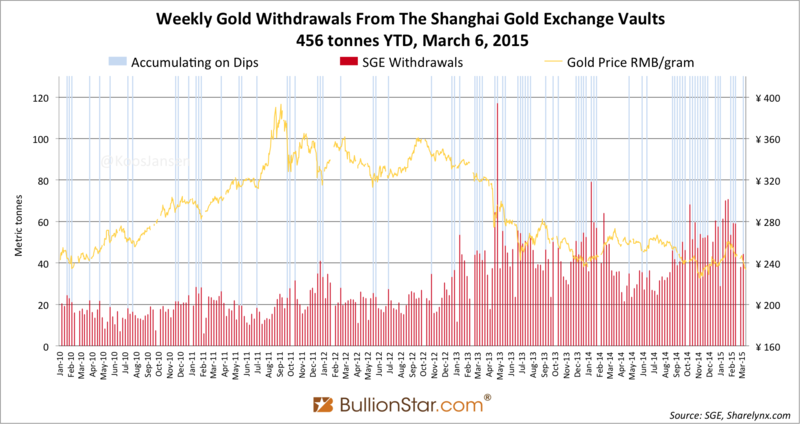 Year to date 456 tonnes have been withdrawn from the SGE vaults. 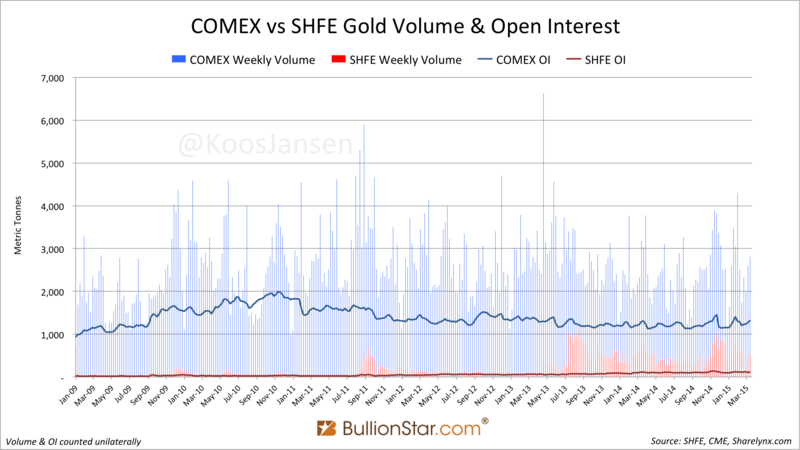 An estimate suggests 340 tonnes has been net imported into the Chinese domestic gold market over this period (calculating with a yearly SGE scrap rate of 250 tonnes). 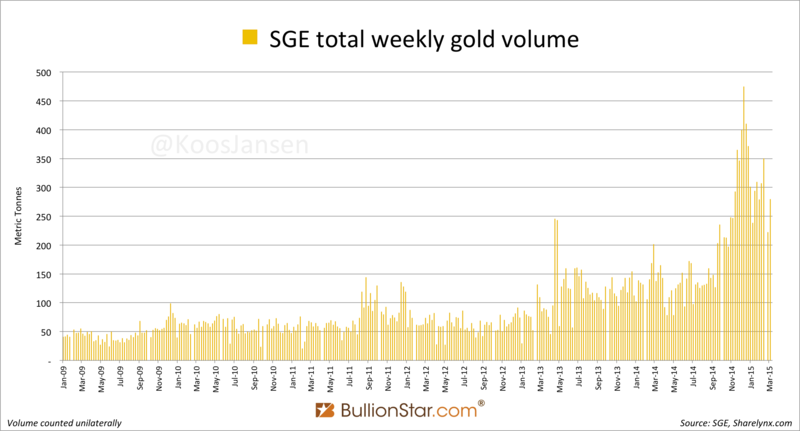 Since the inception of the Shanghai International Gold Exchange (SGEI) there was a possibility the significance of SGE withdrawals, as published in the Chinese weekly reports, became distorted by activity on the SGEI – in the Free Trade Zone. That’s why I corrected SGE withdrawals by trading volume from the SGEI, just to be on the safe side of measuring Chinese wholesale demand. However, we just learned that what was traded and withdrawn on the SGEI in 2014 was primarily imported into the Chinese domestic gold market. So, for the time being we can assume SGE withdrawals are still an accurate proxy for Chinese wholesale demand – a metric described in this post. 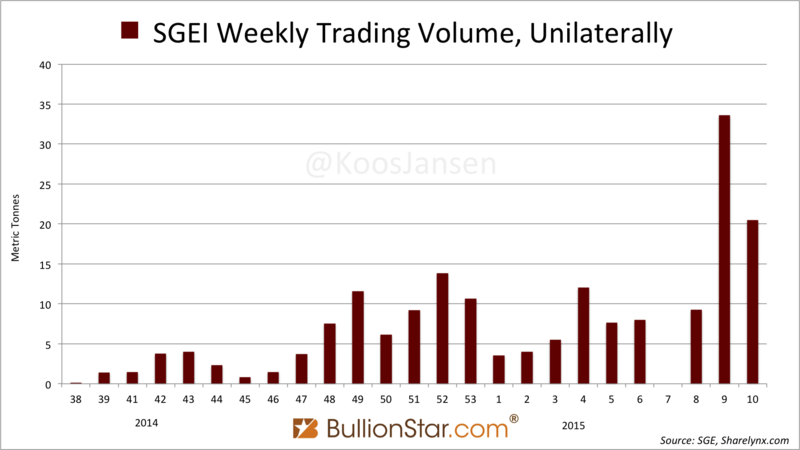 I like to note SGEI trading volume has jumped recently, reaching a record in week 9 at 34 tonnes (counted unilaterally). Perhaps this is exchange is slowly coming to life. Only the 1kg physical contract iAu99.99 is traded on the International Board (SGEI), there seems to be nil interest in the 100 gram physical contract iAu100 and in the 12.5kg (London Good Delivery bars) contract iAu995. Overall SGE volume is somewhat dropping as the spot deferred contracts Au(T+N1) and Au(T+N2) are falling back after a resurrection that started late November 2014. On the Shanghai Futures Exchange (SHFE) we can see the same trend; slightly dropping volumes. Nothing “worth mentioning”.